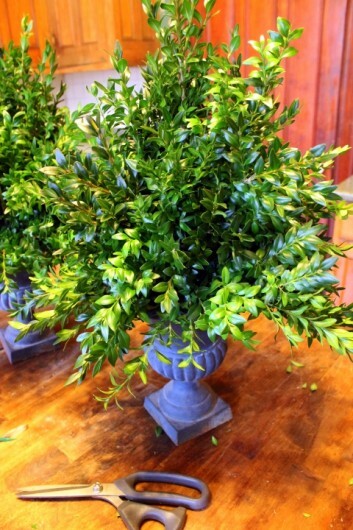 Note: If you don’t have boxwood in your garden, you can obtain the stems from your local, independent florist. 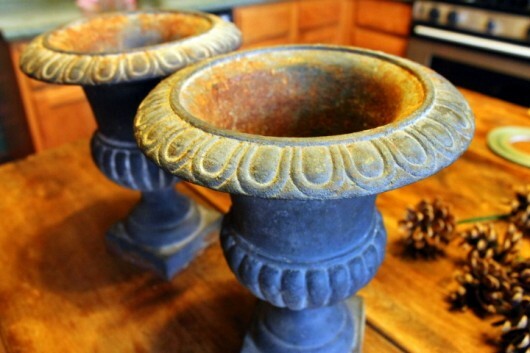 Unfortunately, my urns are not water-tight. 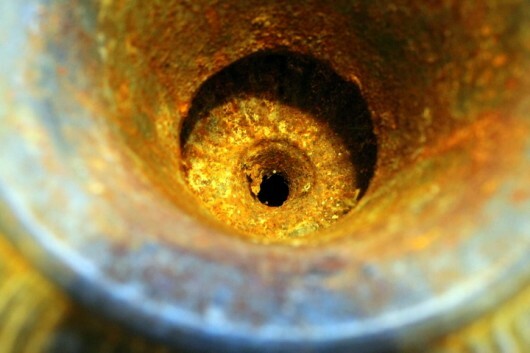 They are equipped with drainage holes. 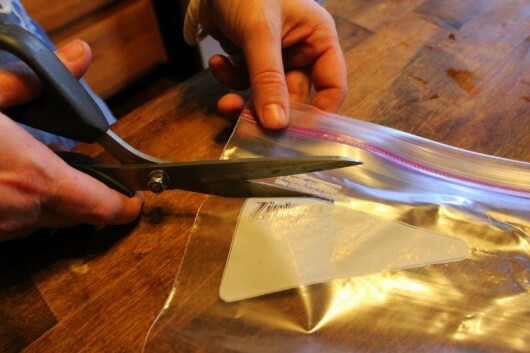 To solve the drainage hole dilemma, Erin took a pair of pint-size zip-lock bags, and cut off the “zippered” part. 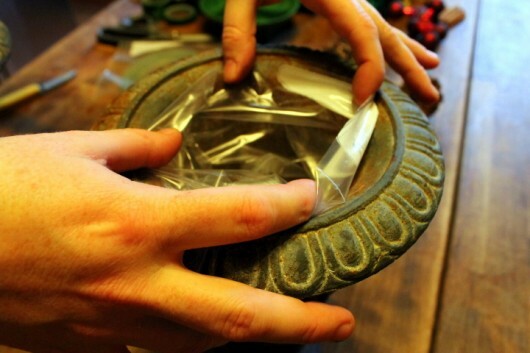 The bags produced water-tight liners for the urns. 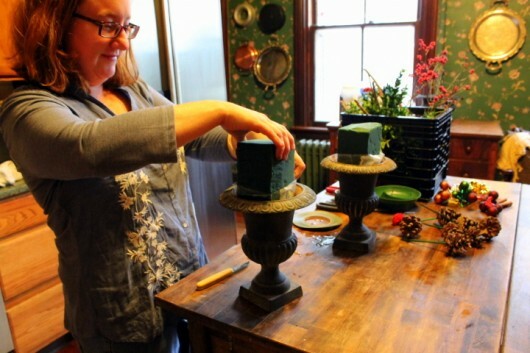 Next, attach a block of well-saturated floral foam to your container. Erin trimmed the foam to fit inside my newly-lined urns. 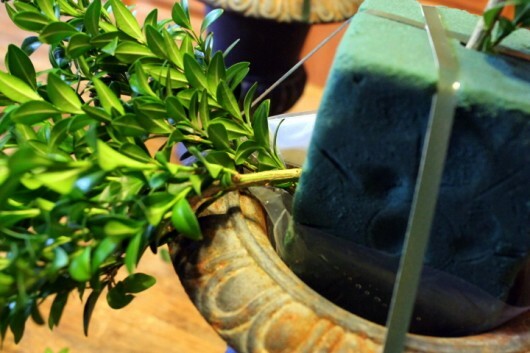 Use floral tape to secure the foam to your container. Finally, insert the boxwood stems! Erin likes to place one sprig of greenery atop the floral foam just to determine the height of the arrangement. Then she moves onto the base. 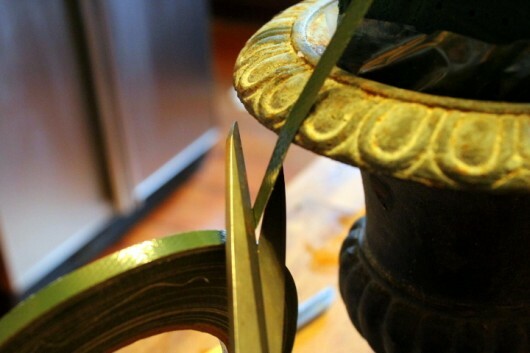 Working in a clock-wise spiral, plunge stems along the base. As pictured above, we angled the lowest stems downward, in order to conceal the plastic bag- liner. 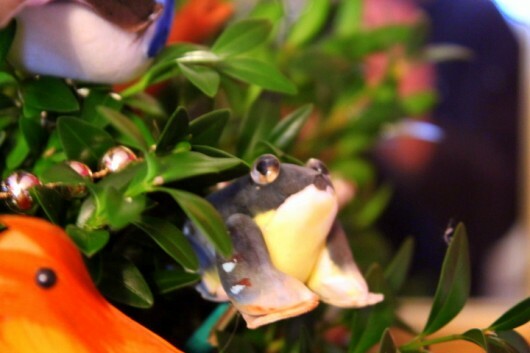 Inserting boxwood stems into floral foam is pure fun, especially if you sip a gin and tonic while you work. True Confession: Erin and I did not sip gin and tonics. Instead, we tucked into some rather strange cookies that had arrived in the morning mail. The sender? My wonderful, wacky mother. 3) What the hell — try one. And guess what? The cookies were not salty, as I’d expected. They were buttery, chocolatey, and — I’m embarrassed to say — delicious. Thus fueled, Erin and I finished our stem-sticking in only 30 minutes. Had we not been eating cookies (and gossiping), we could have knocked this project out in only 15 minutes. I placed the trees at each end of the dining room sideboard. 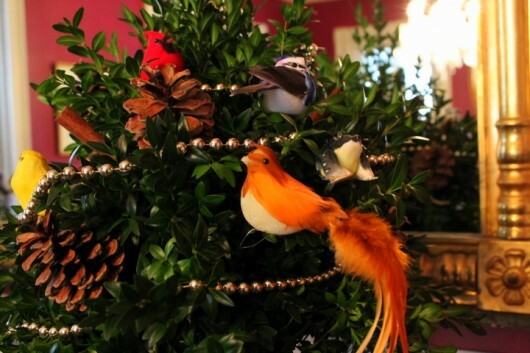 More fun — decorating the trees. Here, the possibilities are endless. You could, for instance, attach cinnamon sticks to wooden skewers, and insert them into the floral foam. 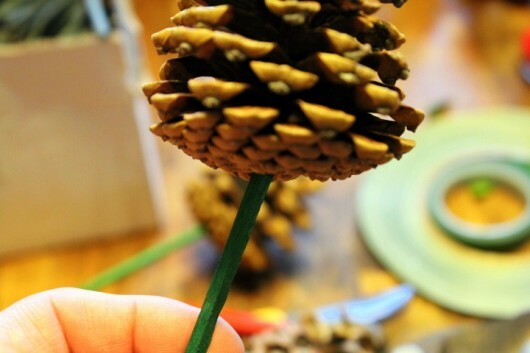 You could insert little pine cones, too. 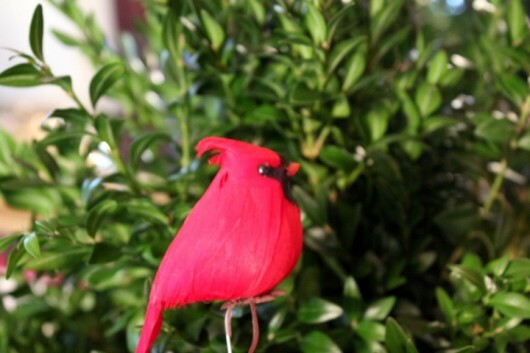 Would you like meet to see the nature-themed components I chose for my boxwood beauties? 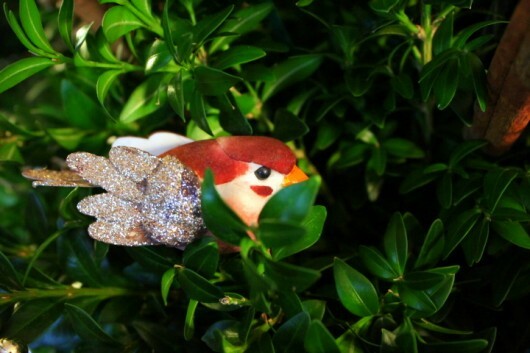 And this copper-toned bird with luxurious plumage. And a bird’s nest, complete with an over-sized Robin’s egg. 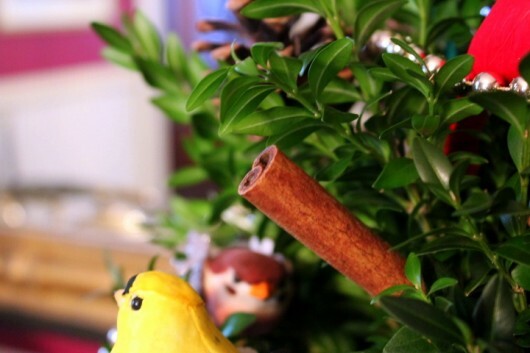 For winter-perfume, I inserted lots of cinnamon sticks among the greenery. 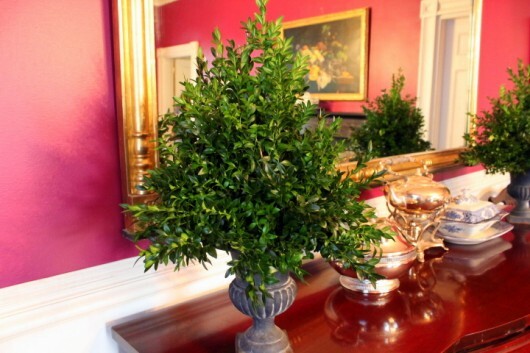 How long will boxwood trees last? In a cool room (not more than 65°F), they can last for weeks and weeks, provided the floral foam is kept moist. The greens will stay fresh-looking in a hot room, too, if you spray them first with anti-transpirant (“Wilt-Pruf”). Well. 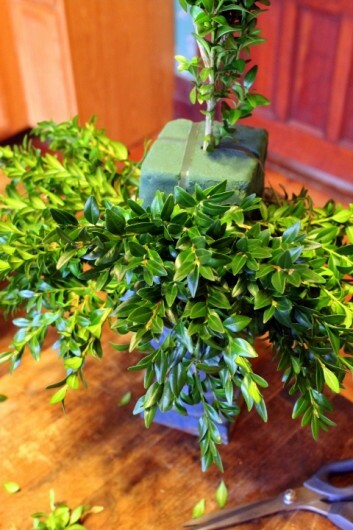 I hope you feel inspired to create your own boxwood tree. It’s a rewarding project to do! You just sparked a nice creative streak in me! After I’m done making Mousakka, and doing laundry, I’m heading outside to get some pretty branches….maybe holly, then make some sort of prettiness bc I’m not putting up a big tree this year. I had so much fun! And they came out great!! 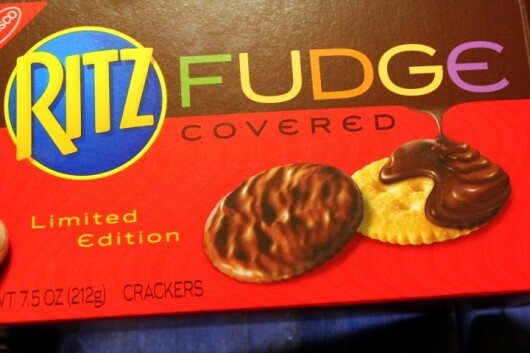 On a side note, I purchased a box of those delicious ritz chocolate crackers at our local grocery store this morning… You got me hooked! 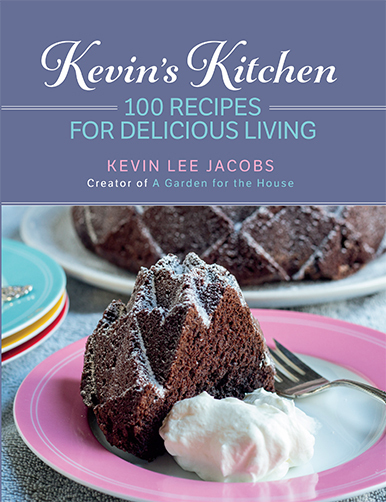 Oh Kevin, thank you so much for this great project. My box woods are still babies , so I will try this with another evergreen. Those arrangements came out beautiful! 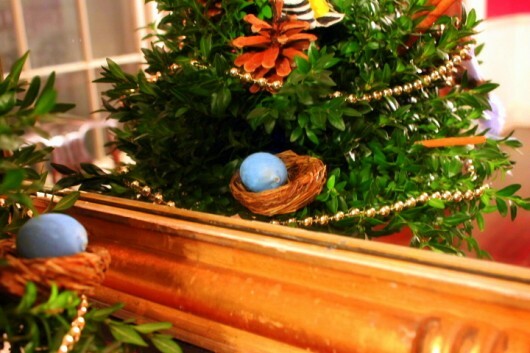 The colorful birds, pinecones and cinnamon, beading and that nest with egg in it added so much. Thanks for sharing this with us and I eat the whole wheat Ritz often with port wine cheese spread..will look for those when I go to grocery store again. I was cleaning up chocolate up from my dining room carpet at 2 am this morning. One of us must have dropped it and didn’t realize it and stepped on it. Resolve carpet cleaner to the rescue..Forunately it came out. I’m like you, I would have expected the salty taste of the Ritz cracker, not the flavor you rec’d. Love how you decorated them! Thanks for making me laugh (again). The apple doesn’t fall far from the tree. I can see that you got your zany humor from mom. She sounds like a fun lady. 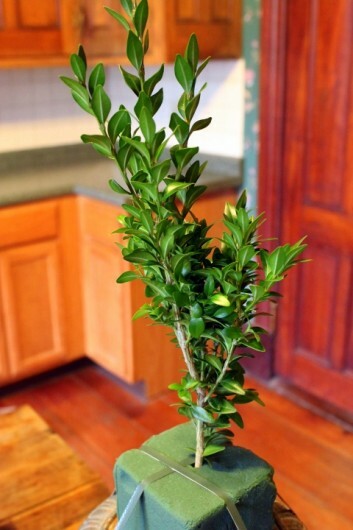 I’ve been entranced by your posts for ages, and am recalling the “boxwood propagating with stem cuttings” article. Would the boxwood cuttings in this project develop roots in the oasis? Please say yes, please say yes! 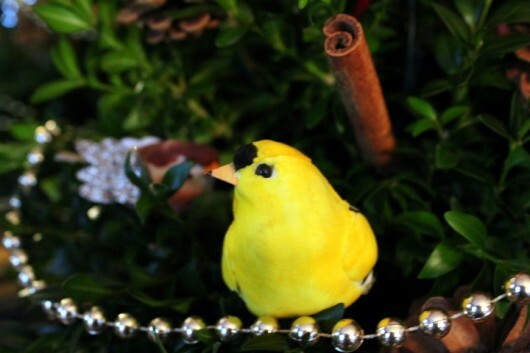 How awesome would it be to make this holiday decoration and then have multiple baby boxwoods for planting outside in the spring? Exponentially awesome, that’s how awesome. How lovely, and I love the scent of boxwoods. Something old and romantic about them. Happy Bday! 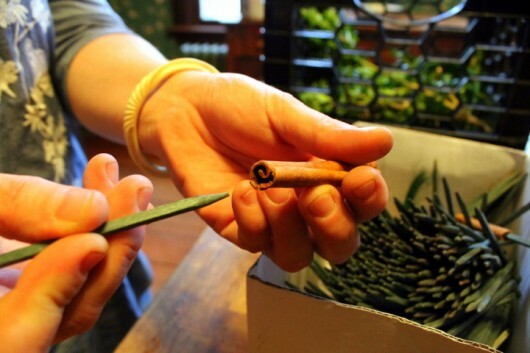 Florist tip- hammer the ends of the fibrous stems (vs. just a sharp. straight cut) before inserting them into the foam. This enables them to soak up more water and last longer. Lovely Kevin, thanks for the tutorial! (Great tip OR Suz, thanks for that too!). Recommended your blog this morning to folks on another blog I subscribe to, think you might enjoy her house and whacky humor as well. Kevin, I have made a holiday treat with Ritz crackers for years. I only do it at Christmas, because I can’t stop eating them.. I put creamy peanut butter between 2 crackers and dip into white chocolate. Lift out with a fork and let excess chocolate drain, then place on waxed paper to set up. These are great little treats!! Having the mirror behind the arrangements doubles their value! I have the same lucky set up in my powder room where I place my own garden flower arrangements throughout the warm months. It’s lovely to see the reflections and admire the backs of the bouquets as well as the fronts. Your projects are really festive! I love how you share so many good ideas. 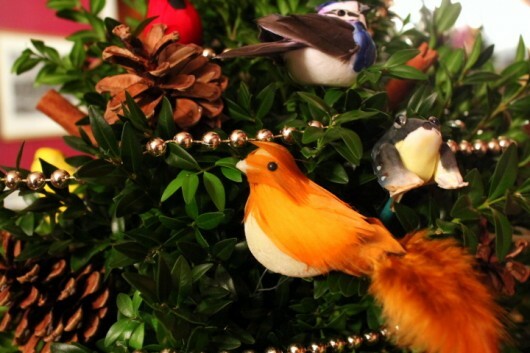 What a great idea – no pine needles to clear up til Easter time!! and just looking at your cinnamon buns photo’s added 5 pounds! Totally worth it! Kevin, can you recommend where to get fresh-ish boxwood springs? Thank you very much. My family won’t let me do a real tree so this would be a great addition for my home. THANKS! Hi Mary Ellen – In my area (which, as I recall, is also your area! ), boxwood trimmings can be found at Crazy Daisy (Main Street, Valatie), and The Berry Farm (between Kinderhook and Chatham on Route 203). As a senior I like the idea of not having to store a Christmas tree and I think i can use pine branches instead to gave the house that nice sell. Good thing you have a Victorian house, because you’d never get away with any of this otherwise. You’re amazing! Everything always looks wonderful. Very pretty arrangement and as always your easy to follow instructions are always appreciated. Love these! 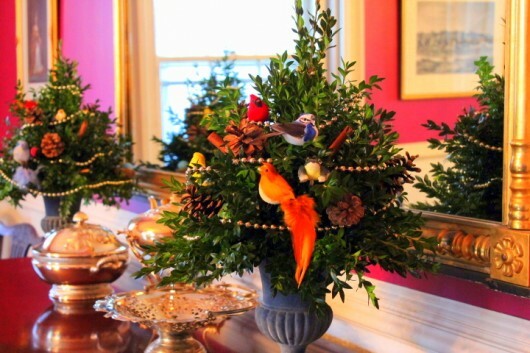 I have lots of ilex opaca and other evergreens (and the boxwood) around my home and I’m going to do a couple of these trees for the front porch. Thank you so much, Kevin. 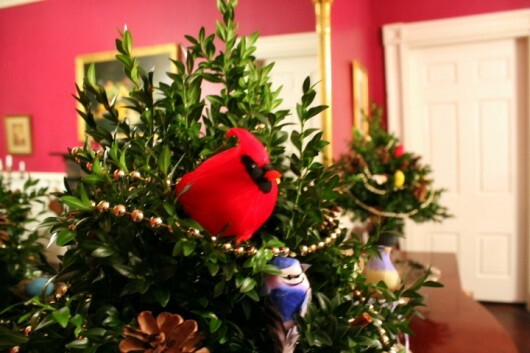 Love the Boxwood Christmas Tree. 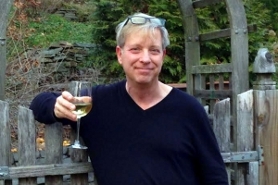 Love your great ideas –and thanks for the inspiration!! I have boxwoods that need a trim! 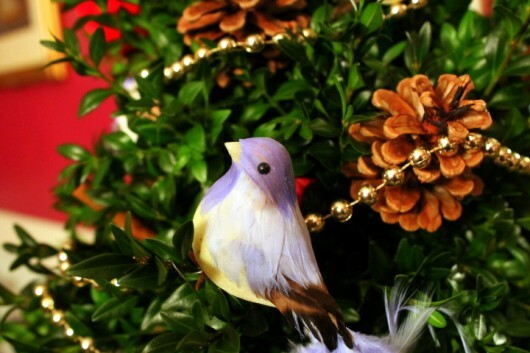 Wishing you and yours a wonderful holiday season. Keep the lovely ideas flowing. As always you inspire. 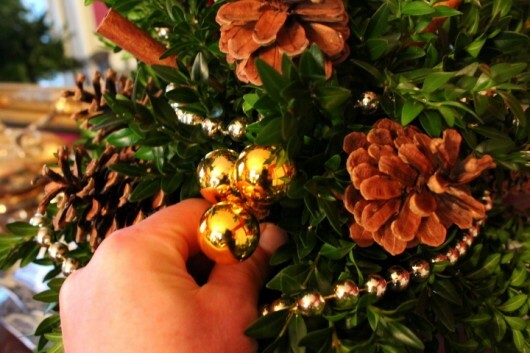 I’m out to prune my overgrown boxwood for indoor trees and especially a garland necklace for my handsome 2′ 6 point buck found years ago after Christmas at the local garden center. He was damaged in that one of his antlers comes off (and on) making it possible for his garland to slip on. Merry Christmas, Kevin.